Shahrukh Khan and the History of Diwali Clashes! It would not be wrong to state that SRK’s superstardom has been scripted mostly due to the festival of lights. Long before other superstars could claim their stake on the Diwali festivity, the ‘Baadshah of Bollywood’ has lent the auspicious festival his box office vigour. Yash Chopra’s Jab Tak Hai Jaan will be his 10th (Yes, you read it right) Diwali release in his illustrious career spanning more than two decades. His earlier Diwali releases were Baazigar (1993), Dilwale Dulhania Le Jayenge (1995), Dil To Pagal Hai (1997), Kuch Kuch Hota Hai (1998), Mohabbatein (2000), Veer Zaara (2004), Don (2006), Om Shanti Om (2007) and Ra.One (2011). All of these movies have created history in one way or the other. SRK’s foolproof 100% Diwali record raises the stakes for his upcoming release Jab Tak Hai Jaan. What makes the record all the more special, is the fact that he has won all the major clashes, with several other biggies that competed against his film. Below mentioned is the list of SRK’s historic Diwali clashes. Kuch Kuch Hota Hai – Bade Miyan Chote Miyan (1998): A dream David Dhawan project starring Amitabh Bachchan – Govinda with superhit music clashed with an SRK rom-com Kuch Kuch Hota Hai directed by debutant Karan Johar. Both films did well eventually but Kuch Kuch Hota Hai overshadowed the comic caper and went on to become an ‘All Time Blockbuster’ breaking many records. Mohabbatein – Mission Kashmir (2000): Hrithik Roshan was a national-craze after the mega success of Kaho Na Pyaar Hai. On the other hand SRK’s releases in 2000, Phir Bhi Dil Hai Hindustani and Josh, failed to live upto expectations. But his never-say-die spirit resurfaced again as Aditya Chopra’s Mohabbatein became a blockbuster. Mission Kashmir got a bigger initial but failed to sustain at the box office. Veer Zaara / Aitraaz / Mughal-E-Azam / Naach (2004): Yash Chopra’s Veer Zaara emerged the first choice for cinegoers for Diwali 2004 ahead of Abbas Mustan’s Aitraaz, the colored version of Mughal-E-Azam and Ram Gopal Varma’s Naach. Though Aitraaz and Mughal-E-Azam turned out to be an average grossers, Naach was a disaster. Veer Zaara went on to be the biggest hit of the year. Don – Jaan-E-Mann (2006): This was a biggie – Shahrukh Khan’s Don squared up against Salman and Akshay Kumar’s Jaan-e-mann. The result? SRK won yet again. Although Jaan-e-Mann was a well made film with melodious music, it failed to match the might of the Don. Om Shanti Om – Saawariya (2007): Farah Khan’s Om Shanti Om clashed with master director Sanjay Leela Bhansali’s Saawariya. The later’s film was much-hyped, as it was the launch vehicle of two star kids Ranbir and Sonam Kapoor. Pre-release, SRK promised to ‘destroy’ Saawariya.. which he eventually did as OSO went on to be the biggest grosser of year, while Saawariya tanked after a good initial. Last year too witnessed a clash, but one that was much smaller in scale. Ra One released with two smaller films Damadamm and Tell Me O Khudda. 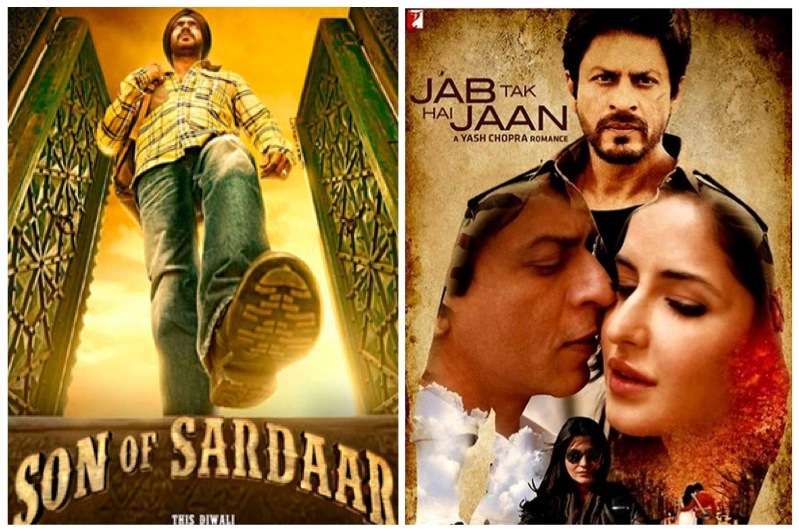 Now, the big question – Shahrukh Khan is all set to take on Ajay Devgan this year, as Jab Tak Hai Jaan clashes with Son of Sardaar. The scenario is slightly different this year – action comedies are raking in the moolah at the box-office, while several romantic films have failed to make a mark. Also, SOS is a remake of a very successful south Indian film. The odds are once again stacked against SRK..
Can Shahrukh make it 10 in a row for Diwali? What will be the outcome of the 2012 Diwali Clash? Vote now! Early Diwali Predictions - What do you think will happen? Will Barfi work for Ranbir Kapoor? Many have come …and many have gone.. But there is only one consistent performer.. He is the most hard working man of the world… He still has the middle class touch from where he has come.. He has super inspiring power, which he shares with his words, work and love..
Shah rukh Khan personifies romance and can be an equally charming superhero. He really gets into the skin of his characters and bring them to life so effortlessly, be it Rizwan Khan of My Name is Khan, Mohan Bhargav of Swades, Kabir Khan of Chak De India or Aman fom Kal ho na ho. He indeed is the best! Both have potential..Hope both work..
SRK is going to win this one easily as well.. When the odds are against him, the King simply pulls up a extraordinary feat.. Ajay will feel SRK’s power this time.. and guess what, with SOS releasing the same day and Talaash following 2 weeks later, JTHJ’s trailer is not even out today and it is trending everywhere… SRK’s the bravest actor of all.. SRK’s the KINGGGGGGGGGG. “Jab Tak Hai Jaan” …. will be a All Time Blockbuster !!!! 20 Saal hogye..each actor came and went..but his comparison with SRK remained the Same..why comparisons with only one person..?why is Salman compared to SRK..why was Aamir compared to SRk..why was Akki compared to SRk..why was Hrithik compared to SRK..
WHy does everything revolves around SRK..? Answer is simple..coz he has been the top actor in the industry..for past 20yrs.. he has been threatened several times..like nowadays..but the fact is that he rises up..like cream from milk..
“Son Of Sardar”….will be a Flop !!!! yes becoz diwali srk become big star and now with diwali srk wil end his career..SOS wont kick out jan tak..lookin at title and poem its same sterotype movie made so many times,if these kind of films succed due 2 luck bollywood wont compete with hollywood it wil compete with bhogpuri cinema..
From 1993- 2000 nobody was even close to SRK…… Around 2000 they said SRK is finished, we have new superstar Hrithik…. THen even commented juniors have shined and seniors have re emerged in form of Amitabh after mohobatein…..
AFter tht Amitabh and Hrithik started giving back to back flops everybody stopped talking and started talking abt SRK……. Then after 2005 when aamir started giving hits they started talking abt aamir…. In meanwhile AKkki gave 4 hits in a row they started GAGA over AKkki and compared tht akki has de throned SRK…..then aamir gave hits comparison started with him….. Then came this Cheap SOuth indian remake hero Salman now they are comparing him with SRK…. so dont wory guys SRK is there always, just need to see whom they will compare after Salman…………..
srk is the king he always wins the overseas battle as well, so first choice will be jthj, it will be the new ddlj. Srk needs diwali to give hit otherwise his movie will be flop. .
Shahrukh Khan makes Bollywood. Without SRK, there is no Bollywood. The whole world loves SRK; SRK’s movies are the best. No one, but no one can do a romance scene like SRK. His acting ability, his good looks, his charm, his charisma, his dancing, and his dimpled smile all combined are just unbeatable. God Bless SRK for the pleasure and enjoyment he brings us through his hard work and passion. I think movie will be flop because it is looking very old type of romantic movie also srk is looking like too much old katrina is looking his daughter so i am not interested in this movie and i am sure no one interested in this movie except srk fans.so sos is the winner and after dabanng2 is ready for breaking records again.